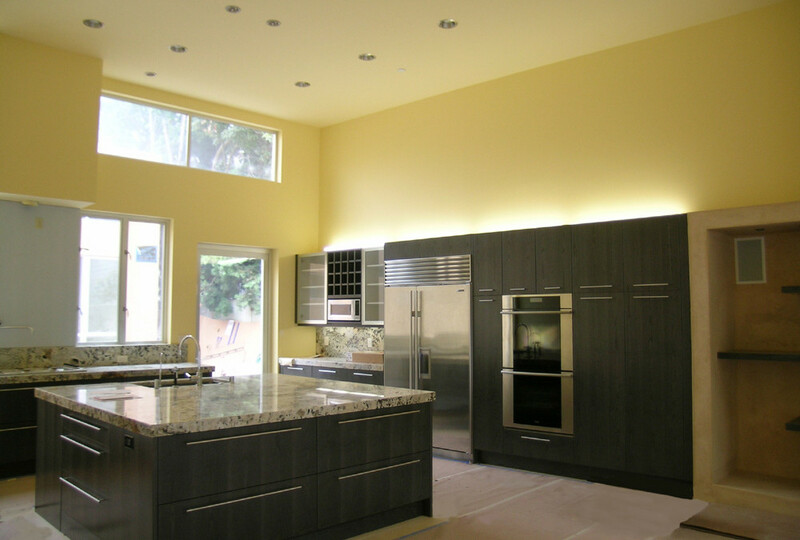 We completed a new home that expresses new concepts of luxury and informality in contemporary home design. The owners of a Los Angeles property commissioned my firm to design a minimalist-style home that would accommodate their simplified lifestyle yet feel expansive and uncluttered. Due to the sloping land and the desire to have the house fully accessible, I came up with the idea of linking the two main parts of the house –bedrooms and living areas- with a long sloping hallway. To accentuate the hallway’s dimensions, I designed 20 foot high ceilings and curved the walls on both sides. This turned the hallway into a dramatic three-dimensional space that engages the viewer by changing with every step. The living areas that overlook the garden pool are tall, well-proportioned spaces that can open up completely to the outdoors with folding glass door panels. Along with the sense of drama imparted by the soaring spaces, the rooms feel comfortable and in the words of one viewer “just right”. Growing up in Paris I experienced homes and public spaces with a large scale and grandeur about them yet possessing a sense that you could pull up a chair and relax by the fire. I try to impart that quality of a wide-open space that feels informal enough for a quiet conversation. With this new home, it appears that we have succeeded in conveying grandeur and informality all at once. Copyright © 2014 Eckelberry.biz .